Is this an Illegal Act in Italy? Live High, Train Low is the training model a lot of elite athletes are trying to simulate these days (especially in Colorado). With the help of altitude tents and oxygen supplemented training techniques simulated high altitude sleep, and low altitude training workouts can be achieved with relative ease (but also a lot of cash). You can bet with the Olympics just a few weeks away that the final touches are being added to peak training regimes with a dash of simulated altitude methods for good measure. How far will athletes go to show up in Beijing in peak form? Is manipulating natural EPO levels by way of artificially simulating high and low altitudes acceptable? Well the Italian authorities have taken a stance and made altitude tents illegal in their country. I wonder if the reverse is also illegal? Can an athlete who lives high up in the Italian Dolomites use extra oxygen delivered through a tank to simulate sea level training intensity without the risk of going to jail? While we are at it, I wonder if it is legal for an Italian to go away and sleep in an altitude tent in nearby France and then return to race in Italy with the subsequent benefits? Tour de Nez Final Stage, Northstar Village, CA. The final stage of the Tour de Nez was yet again an up and down affair. Even though the "Nez's" stages are relatively short they are far from easy. There was not one minute of recovery in the entire 4-day, 5-stage, event. To view and download my race power file click here. The final race on Saturday consisted of 22 laps of a hilly, 2-mile technical circuit. The field was down to about 56 starters and my goal was to hopefully move up a few spots in order to finish top 30 overall. Bang! The starters pistol was shot and 56 riders went sprinting out of the start line as if we were starting a criterium. We quickly descended the downhill portion of the course and within a minute hit the first short hill and cobble section through the Northstar Village. The cobbles added a European feel to the race and yet again took away any chance of recovery on what otherwise would have been the easiest section of the course. I must say I was suffering like a dog but rather enjoyed the atmosphere of racing through a ski village. Million dollar penthouse condos loomed four stories above and spectators lounged in comfy leather couches sipping coffee and beer. What could be better. About five laps into the race I was able to help my Vitamin Cottage/XP Companies teammate Jon Baker leap off the front of the group and bridge to a small breakaway. Having helped Jon as best I could I quickly went back to survival mode and tried to stay hidden within the second group and conserve precious energy. Half way through the race the break with Baker was about 30 seconds off the front and I found myself still in the 2nd group with the GC leaders. Our group was down to about 19 riders and I was pleased with my efforts. However, I knew it was going to be short lived. With 9 laps to go I popped off the back of the 2nd group and found myself chasing solo. Luckily I caught two riders and we put our heads down and worked well together to the finish. Somehow the results got messed up as I finished with two riders yet the results show me as finishing alone. Oh well, in the end I rode a solid race and moved from 33rd overall to 28th place in the final general classification. This is certainly not a great result in the grand scheme of things, but for a guy who trains about 10hrs/week and hasn't raced an NRC stage race since 2002 I'm really happy with 28th. I'm even happier for my team though since Jon Baker finished 2nd on the final stage which was his second, 2nd place of the week. With just a tad more luck Jon could have won two NRC races last week. *This race also produced my second highest Normalized CP 20 of the year at 398w. 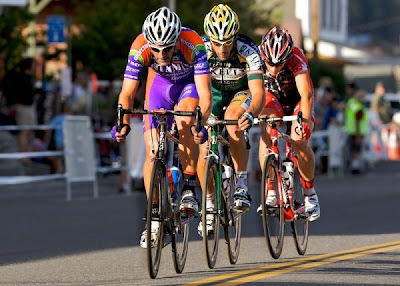 It is now time to recover and think about the next local Colorado race which is the Niwot Criterium in a few weeks. I may also do the local Wednesday time trial series this week. This week I am racing my only national calendar stage race of the year and my first since my retirement from pro racing in 2002. It has certainly been a wake up call and I haven't had an easy moment since I started this race on Wednesday evening in Reno. My first race back on the pro circuit wasn't supposed to be like this. I crashed about half way into the race when an orange barrier cone got flipped into the group and caused a big pileup. I lost skin and got a pretty deep muscle bruise on my calf, but it could have been a lot worse. Taylor Tolleson of BMC broke his collar bone I heard. Hopefully he has a good quick recovery. The first mile of this race was the hardest. It probably averaged 11% and hurt a ton. I finished 37th 1:15 behind the winner. Finally something to hang my hat on, eventhough it was only for 7 minutes....Somehow i found the motivation to attack off the front of the Trucke criterium and felt somewhat under control doing it. An ex-teammate of mine on Rocky Mounts, who now rides for Kelly Benefits, Alex Candelario bridged up to me and we sat out front for about 8 laps. Once we were caught my teammate Jon baker countered and established the winning three man break where Jon ended up placing 2nd. Oh My.....so that hurt...Just 3 minutes into the race I knew it was going to be everything I had to finish this 100km circuit race. My peak 5-minute value for the race was in the first eight minutes and equated to 412w. That is not how I wanted to start the day. Today's race was 10 laps of a 10km course and none of it was flat. The course was basically one climb followed by a descent and back up the same climb again. The group separated on the second lap and I found my self in the third group on the road wondering how I was ever going to finish this insanely hard race. I ended up sticking with a group of about 10 riders which split up in the final two laps and I somehow finished 39th out of 56 finishers. I was 19 minutes behind the winner and about 2 minutes from being lapped. Unfortunately at the time I would rather have gotten lapped and therefore been able to skip the last lap, but in the end I did all 10 laps. My teammate Jon Baker finished 16th on the stage and is now in 14th place in the overall GC. I dropped from 28th overall to 33rd. One more stage to go which is the North Star circuit race.